One of the wealthiest communities in the U.S., Burr Ridge has humble beginnings. Much of the Village’s original property was farmland and property that formerly housed the Bridewell Prison Farm. On October 30, 1956, 143 local residents incorporated as the Village of Harvester–reflecting the importance of the nearby International Harvester research facility. 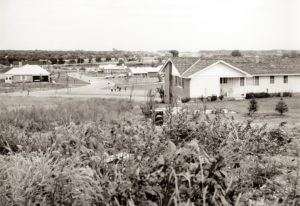 In August 1962, the Village changed its name from Harvester to Burr Ridge. For a more detailed history of Burr Ridge visit the Village’s website and read “From Harvester to Burr Ridge, 1956 to 1970s.” Stop by the library to peruse A Very Special Place by Purdie McCullough and Images of America: Burr Ridge. A visit to the Flagg Creek Heritage Society’s Historical Museum and the Vial House will bring the history of Burr Ridge and its surrounding area to life. An affiliate of the Pleasantdale Park District, the Flagg Creek Heritage Museum is open the first Sunday of every month, April-October from 2 – 4 pm. and from 10:00 a.m. until 1:00 p.m. on most Mondays all year. View historical photos of the Burr Ridge and Indian Head Park from the Flagg Creek Heritage Society Museum on the library’s Flickr account. If you have historical photos of Burr Ridge that we could scan, please contact Mary Krekelberg at maryk@ippl.info or at 630-887-876, ext. 240.